In 1988 I was a one-year-legislator with the now-seemingly-reachable ambition to be President of the United States. In the “Open Letter” to my kids I say why I still believe to this day that the politics I wear on my sleeve can be mainstream politics, the politics of a majority of Americans. Although this ambition to be President hit a glass ceiling in 1993 (as described in “Third Time’s The Charm”), in 1988 I was at the pinnacle of success supporting Jesse Jackson for President over Michael Dukakis. Jesse Jackson mainstream? I was elected by a state-wide group of Democrats to be a Jackson Delegate to the Democratic National Convention in Atlanta in 1988. To this day I believe that Jesse had more appeal for mainstream America than Dukakis showed in the race against the first George Bush. In 1968 Jesse was marching in the streets for civil rights with Martin Luther King. In 1972 I was a protestor in the streets at that year’s Democratic National Convention in Miami Beach. 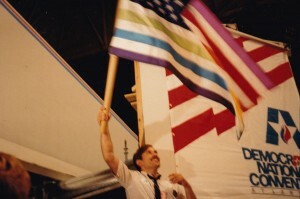 In 1988 Paul Wellstone was on the plane with me flying to Atlanta, also a Jesse Jackson Delegate. By 1988 I was elected to serve in the Minnesota Legislature, Jesse Jackson was making a serious run for the Presidency, and two years later Paul Wellstone became a United States Senator. Before Paul’s plane went down in 2002, he was on his way to becoming President of the United States. Getting inside the system to change the system is still the best way for the Movement for a New America to succeed. In 2013 I believe mainstream America is more ready than ever to embrace the protest politics that we all can do better than what we’ve got. Are you and your family better off now than you were in 1988? Are you as likely to get a pension upon retirement as I was? Do the Democrats and the Republicans stand for what’s best for our Country? Let’s get our current group of protestors into office! It was a heady experience brushing up against the top echelon of politicians in Atlanta: Not just the Walter Mondale and Ted Kennedy types, but also the Tom Haydens and Ron Kovics of the world (fellow protestors now inside the system). Being officially wined and dined and escorted around was fun, but the protestor in me just couldn’t stand seeing the perimeter of the Convention Center walled-off with a ten foot high barbed wire fence and hundreds of protestors on the outside. On the night Jesse Jackson’s name was put into nomination, I hatched a plan. Once the entire Minnesota Delegation of Jackson Delegates was seated on the Convention Floor, one-by-one I asked them to give me their credentials (official passes to get through the barbed wire gates), promising I would give them back within the hour. Got about 40 sets. Then I left the Convention and found about 40 Homeless Protestors outside, handed out the credentials, and escorted them inside. We got past security into the Convention Center but at the entrance to the Convention Floor the Fire Marshall said the place was at maximum capacity and not even a Ted Kennedy could get in. So we retreated to the salon outside the floor where there were big screen TVs of the goings-on, a grand buffet and free cocktails. I was profusely thanked by the Homeless for the great meal, gathered back all the credentials, and then managed to get back on the Floor myself to cast a vote for Jesse. P.S. Paul was my roommate in Atlanta and some of us already had plans afoot for his U.S. Senate run.